With the holiday season, I have been wanting lighter things to read. 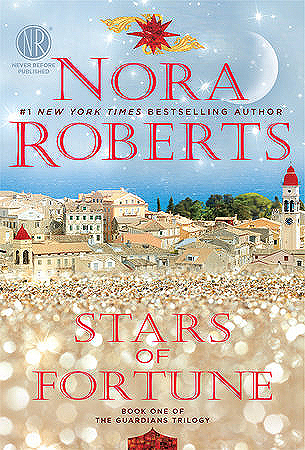 The other day, I picked up a book at the library mostly because it had a beautiful cover: Stars of Fortune by Nora Roberts. Before this book, I had never read a book by Nora Roberts except for two of her In Death series, which she writes under the pseudonym J.D. Robb. I was a bit afraid that this book would be a bit too frothy and romantic for me, but it ended up being just what I needed to chill out and relax. This book is hard to describe because it crosses so many genres. I think it’s apt to call is a contemporary magical realism romance. There are fantasy elements, but it takes place in our current world. There is also quite a bit of romance, but I thought it was offset nicely with the plot. I certainly don’t mine romance, but I dislike when it is the primary plot and there is little else in the story. Thankfully, this one had an exciting fantastical plot and a traditional quest often found in fantasy and magical realism. Also, while this was definitely plot-heavy rather than character-focused, I did find myself really liking the character of Sasha. I felt like I could see my own insecurities in her, and I was definitely rooting for her. In this story, 6 strangers band together to find 3 mystical stars that have fallen in order to keep them out of the hands of a dark fairy who wants to destroy the moon. As you may have guessed from that sentence, this book does require more suspension of disbelief than most that I recommend on this blog. If you love intricate character development and detailed world-building, this probably isn’t the book for you. It’s imaginative and fun but it is very fluffy and a bit shallow. Still, I really enjoyed it and I’m excited to read more of Nora Robert’s works when I’m looking for pure escapism. I think I’ve found a new guilty pleasure! Previous postWhy do YOU Read? Next postBest Books of 2016!